Two years after the post-Godhra pogrom, Gujarat continues to be a communally polarised State, thanks to the systematic work done by Hindutva organisations. WHEN childhood lovers Reema and Anthony of Ahmedabad eloped to Mumbai, they hoped to lead a happy life thereafter. But it was not to be. Reema’s conservative family roped in the Bajrang Dal and the Vishwa Hindu Parishad (VHP) to get back their daughter. They planned to trap the couple. Reema’s mother met Anthony’s parents and said all was forgiven. She told his parents to ask them to come home. But the couple did not go back. So she secured a search warrant and made them return to Gujarat to confront the court. It was a trap. Everything went against the couple. The hearings got delayed and Bajrang Dal activists gathered outside the court everyday to intimidate them. They beat up Anthony, pushed Reema (who was pregnant) on the ground, grabbed her and pulled her into their car. Anthony rushed to the magistrate but he refused to help. People who heard him shout for help stopped the car. Soon they all were in the police station. There the Superintendent of Police convinced them to let Reema stay in her mother’s house for the night to ensure her safety. But that night, her family sent her to her uncle’s house in Rajasthan. The uncle, incidentally, is a Bajrang Dal leader. From then on, her life was in their hands. They made Reema sign a statement saying that she was forced to marry Anthony. Then, they allegedly took her to an abortion clinic in Himmatnagar, Gujarat. Reema was put up in a farmhouse in Pirana. When it was found out that she managed to telephone Anthony, she was shifted to a Bajrang Dal leader’s house. Next, her people arranged to get her married. They forced her to call Anthony’s house and say that she wanted a divorce. But Anthony refused. That was when the death threats began. He fled to Mumbai. Soon after they arranged Reema’s wedding in her uncle’s factory in Naroda. Reema explained the entire story to her new husband. She called Anthony, hitched a ride on the highway, met him in Vadodara and went back with him to Mumbai. TODAY Reema and Anthony live in exile. They are refugees from a culture of intolerance. The forced separation of these two people is symbolic of the larger separation of communities that Hindutva aims at. This mindset is most prevalent in Gujarat - the Hindutva laboratory. 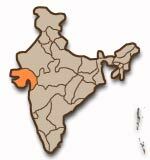 Gujarat has the best network of Rashtriya Swayamsewak Sangh (RSS) cadre working in every part of the State. Methods of mobilisation vary, depending on whether it is an Adivasi-dominated area, an industrial city or a village dominated by the Patel community. But the basic aim is to keep people apart, whether by stirring trouble or creating prejudice. For them, Hindu unity means the suppression of others. Minorities can live only if they accept the might of the majority. And the twain should never meet. If they do, they face the consequences Reema and Anthony did. The divide has widened owing to the ghettoisation of big cities such as Ahmedabad and Vadodara. Muslims are increasingly seeking safety in numbers. People refuse to sell them houses in `Hindu’ areas. Unwanted anywhere outside their own community, Muslims tend to cluster together. There are a few large Muslim pockets in each big city - referred to as `mini Pakistans’, even by the Gujarati press. The term itself connotes that everyone living there is an `enemy’. A `border’ separates communities. With every riot, the walls at the border get higher and more protected with shards of glass and barbed wire. Segregation has meant less communication. This makes it easier for Sangh Parivar organisations to propagate prejudices and stoke the fear of `the other’. Even in elite areas, Muslims are not allowed to buy property. When Muslims bought flats in Paldi, an upmarket area of Ahmedabad, Bajrang Dal activists ransacked the building and threw a bomb that blasted the lift. Later, they forced the Muslim owners to sell their flats at a pittance. In Ahmedabad’s walled city, the Bajrang Dal attacked traders who sold property to Muslims. Even schools are ghettoised. After the communal carnage of 2002, several schools asked Muslim students to leave. In Naroda Patiya, where some of the worst killings occurred, children refused to go back to school after teachers made them sit separately. Many Muslim parents withdrew their children from good schools and admitted them to sub-standard schools in Muslim neighbourhoods, just because they felt that their children were safer in schools closer to home. After the communal pogrom, even parts of rural Gujarat are ghettoised. Many refugees have been unable to return to their homes. They prefer to stay in nearby towns or villages with a relatively large Muslim population. They feel that isolation makes them easier targets. After hounding out Muslim residents of villages, local Bajrang Dal units proudly put up banners proclaiming them to be `Muslim-free’. Elderly Muslim residents who tried to return to their homes in Pavagadh, a village adjoining a temple in Panchmahal, were beaten up and chased out. Local leaders of the Parivar took over control of their shops en route to the temple and refused to let them return. Even today, Salim Sindhi is living in a tent in a relief camp, though he is the sarpanch of Kidiad village in Sabarkantha, north Gujarat. He had to sell off his agricultural land. He will never return to his village. The killing may be over, but the injustices continue. EVERY festival is dreaded, not celebrated. Vinayaka Chathurthi, Holi and the kite festival are often used as a spark for violence. Recently, on Moharram day, Muslims in Gujarat decided not to take out tazia processions in order to avoid giving trouble-makers an opportunity. The VHP has appropriated and organised several festivals, such as the Jagannath Rath Yatra in Ahmedabad. These provide opportunities for people to be at their boisterous best. Often that means shouting slogans against or antagonising Muslims with the intention of creating trouble, and then, blaming them for `attacking Hindus’. Muslims living in Ahmedabad’s walled city send their women and children away on the day the procession passes through their area, while the men stay back to guard their homes. The Rath Yatra has often sparked communal violence in Ahmedabad, including the worst massacre in 1969. The minute the yatra passes out of their neighbourhood peacefully, Muslims hiding in their homes suddenly rush out to greet the local Police Commissioner and thank him. Since the mid-1980s, yatra politics has helped the Bharatiya Janata Party gain support. Initially the BJP supported the anti-reservation agitation by the upper castes. These agitations turned bloody and resulted in violent clashes between 1980 and 1985. In 1985, Gujarat witnessed the most fierce caste riot, which later turned communal. After that the BJP changed its anti-Dalit stand to a communal stand in order to get more supporters for the `Hindutva’ parivar. Its efforts to `unite Hindus’ brought together lower castes. It also left a trail of destruction even in rural and Adivasi areas, previously untouched by communal violence. During the Ram Janaki Dharma Yatra in 1987, Adivasis in Kheda and Sabarkantha districts participated in communal violence for the first time. In 1989, the Parivar garnered more support when its activists went from door to door and village to village during the Ram Shila Pujan Yatra seeking support for the construction of a Ram temple in Ayodhya. In 1990, L.K. Advani started his Somnath-Ayodhya Rath Yatra. It sparked violence in 26 places that it passed through. In December 1992, Surat and several other parts of Gujarat burned soon after the demolition of the Babri Masjid. TODAY, much of the BJP’s strength stems from the lack of any organised Opposition. The Congress(I), which has traditionally cornered Adivasi and Dalit support, has put up a feeble fight. At a time when workers were being laid off with the closure of textile mills in Ahmedabad, the Parivar gained from unemployed youth’s disillusionment with the Congress(I). They are the foot soldiers whom upper-caste leaders of the Parivar use during riots. But, the upper and middle castes still control the BJP. In 1991, as many as 63 per cent of the State and district leaders were from upper or middle castes - Brahmin, Bania, Patidar or Rajput. Several powerful cults and sants, such as the Swaminarayan sect and Asaram Bapu, help the Parivar propagate regressive religiosity. At the local level, the VHP operates through innocuous-looking bhajan meetings. Moreover, the Parivar has managed to get its people into important public positions. Most primary school teachers are Parivar activists. In the tribal areas of south Gujarat, they organise `reconversion’ ceremonies for Adivasis, giving them a new, Hindu identity. Through these religious gatherings, they recruit youth for their cadre, train them to use weapons and teach them how to deal with riot situations or any `threat’ to their religion. The Vanvasi Kalyan Ashram (VKA), the RSS affiliate that works among the Adivasis, also runs several schools in Adivasi areas. It is because the network is so well-entrenched and organised that the 2002 pogrom against Muslims was so widespread and targeted. The VHP had voters lists, weapons and well-trained cadre at its disposal to attack Muslims. Reema and Anthony were hounded out because of the myth that `they (other religionists) are stealing our women’. Besides, it stems from a deep-seated delusion, and also from a casteist bias, which the Parivar propagates. It is the Parivar’s brand of Hinduism - Hindutva - that everyone must adhere to. For it, happy endings are only meant for those on the right side of the `border’. in Frontline, volume 21 - Issue 06, March 13 - March 26, 2004.